The flat surfaces with the drilled holes are what I'm talking about. 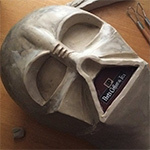 When molding a mask, a piece of cardpaper or clay would have to seal the teeth holes so that the molding compound stops there. I just happened to call them "Panels" for a lack of a better term. I imagine that the 20th Century may have been molded with a clay seal because you can see the grill pattern clearly, and clay that is coming through the diamonds, kind of like how when you bake bread you see how dough rises. Although it's been a very long time since I've really studied all the details of accurate masks, I recall some of my previous observations of the 20th Century that although suffering from a loss of detail and size compared with the TM, I do believe the 20th Century to be part of that lineage tree, and perhaps a little farther from the original. (I'm not saying that the TM fathered the 20th centuries, not by a longshot, but there are consistent flaws in surviving 20th Century masks - particularly the crown areas - that indicate they came from a flawed source, be those flaws in a mold or a casting one generation up). The original TM had its teeth holes cut out, so the grill marks in the teeth holes of the 20th Century may provide some clue as to what the UK mold's teeth grill might have been. So if the TD has some traits similar to the TM (i.e. UK traits) but the grill marks are shallow on your teeth holes, then it may suggest that it came from a different mold altogether. Perhaps someone who wanted a keepsake. It's been so long for me since we spoke about the TD that don't remember the details of the TD any longer. Did it have the same clay pattern in the chin triangle as the TM? Is that how we originally came to the conclusion that the TD and TM were related? If so, I think it would be worthwhile to compare the grill depth and details in the TD against the 20th Century. Don Bies - if he hasn't been already scared off the RPF - might be able to recall what the 20th Century's master was and provide some insights. Ya that's a bad image. Try darkening it, and even as it is in the middle tooth gap below the top hole you can see a pretty prominant "X" in just the right place. Those surfaces you refer to look flat because of the direct lighting, but they are really no different than what we find on the 20th C or the VP. I used to have the first pull VP and also have a DS 20th C copy so I've compared the grills quite some time ago. 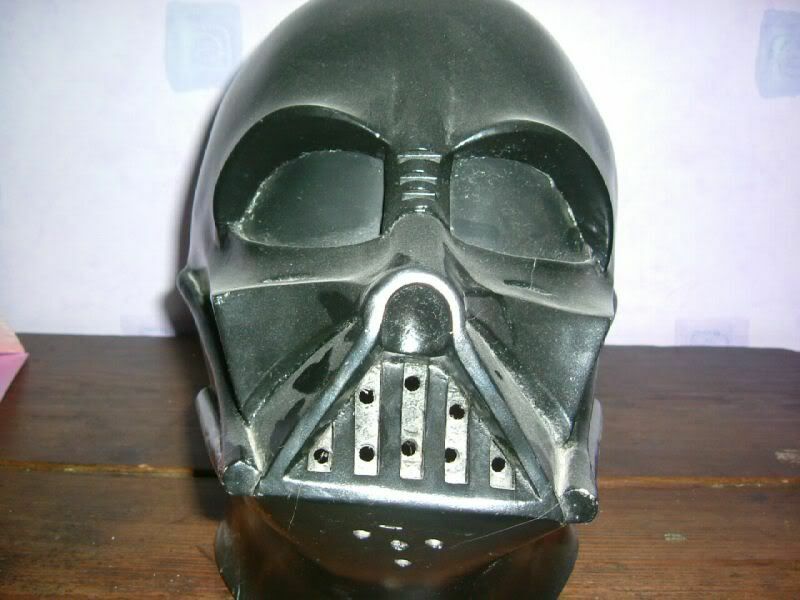 Yep, well you are seeing basically what the original grill looked like when the original ANH mask was first molded...to make the UK mold or whatever at that time. Although it's been a very long time since I've really studied all the details of accurate masks, I recall some of my previous observations of the 20th Century that although suffering from a loss of detail and size compared with the TM, I do believe the 20th Century to be part of that lineage tree, and perhaps a little farther from the original. Right, the 20th C is noticably smaller than a TM. And yes it is quite a bit smoother than a TM, a lot more cleaned up overall, more so even than a VP. Well, it is very possible that something the TM came from fathered the 20th C.
but there are consistent flaws in surviving 20th Century masks - particularly the crown areas - that indicate they came from a flawed source, be those flaws in a mold or a casting one generation up). I'm curious which flaws you noticed on the 20th C crown area in comparison to the TM? Well yes the 20th C, VP and TD all show the original ANH grill, in different amounts of wear but essentially the same grill filled in the same way. The TM almost certainly would have had the same grill and fill pattern. Well the TD and TM come from different molds but certainly share a common ultimate source. As to when and where the branch in the lineage occurs I do not know. But the grill isn't what distinguishes them because I am pretty sure the TM would have had the same grill. One of the stranger differences that point to a different mold is that the tabs on the TM are raised up a bit but flush on the TD (and the 20th Century for that matter). Clearly the VP and TM are very closely related, while interestingly the TD and 20th C are more closely related. Yes the TD, VP, and TM share the same clay pattern in the chin triangle, for the most part. Again not perfectly identical but close and clearly pointing to a similar ultimate source. The contention that the TD should have had a neck extension came from that since the neck extension appears to be made in the same way as the filler in the chin vent. And understandably why would they mold the mask with the filled chin vent at one point then later on with a neck extension...it is more reasonable to think it would have been at the same time. But the TD neck doesn't appear to have had an extension. It would be nice if Don knew, although I wouldn't put too much hope in him remembering specific helmets in that way.